Yosemite became the first wildland in the nation protected for all-time 150 years ago when President Abraham Lincoln signed the Yosemite Grant Act, protecting the Valley and Mariposa grove. Later, in 1890, it became a national park. Over the last 150 years the park has played host to a number of dignitaries and celebrities – as well as about 4 million regular visitors a year. – John of the Mountains: The Unpublished Journals of John Muir, (1938) page 350. Find more of his quotes, from The Sierra Club. Over eons, rivers and glaciers somehow carved 3,000 feet into solid granite to create Yosemite Valley. The nuances of the Valley form spectacular rock formations, for which Yosemite Valley is famous. 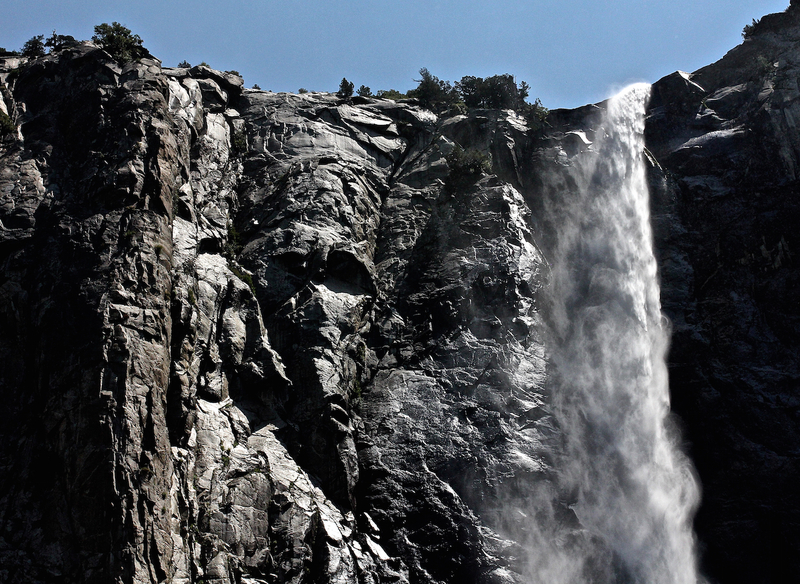 Prominent as you enter Yosemite Valley, it’s hard not to notice the beauty of Bridalveil Fall. The native people of Yosemite Valley, the Ahwahneechee Indians, called the fall “Pohono” meaning “spirit of the puffing wind.” Early Yosemite pioneers named it Bridalveil Fall because of the flow’s resemblance to a bride’s veil swaying in the wind. The Gates of Yosemite scene where this fall stands opposite the mouth of Yosemite Valley to El Capitan is often what comes to mind when I think about Yosemite National Park. Ever since the landscape photographer Ansel Adams captured and immortalized the “Gates of Yosemite,” it was probably instrumental in making Bridalveil Fall one of the most photographed waterfalls in the park. El Capitan is a favorite for experienced rock climbers. Rising more than 3,000 feet above the Valley floor, it is the largest monolith of granite in the world. El Capitan is opposite Bridalveil Fall. Along with Half Dome, Yosemite Falls is the iconic symbol of the grandeur and beauty of Yosemite National Park. I think the falls are practically synonymous with the incomparable Yosemite Valley.Yosemite Falls is one of the tallest waterfalls in North America, with a total drop of 2,425 feet. Half Dome is perhaps the most recognized symbol of Yosemite. Rising nearly 5,000 feet above the Valley floor, it is one of the most sought-after landmarks in Yosemite. Rising nearly 5,000 feet above Yosemite Valley and 8,800 feet above sea level, Half Dome is a Yosemite icon and a great challenge to many hikers. Despite an 1865 report declaring that it was “perfectly inaccessible, being probably the only one of the prominent points about the Yosemite which never has been, and never will be, trodden by human foot,” George Anderson reached the summit in 1875, in the process laying the predecessor to today’s cable route.